The 'Ultimate Deletion' match between 'Woken' Matt Hardy and Bray Wyatt did not disappoint. The two men traded blow-for-blow on Matt's personal property, and it will go down as one of the top WWE moments of 2018. When all was said and done, Matt emerged victorious - thanks to a little bit of unexpected help. Brother Jeff Hardy returned at the site, singing the "He's Got The Whole Word In His Hands," to Wyatt. Matt won via pinfall, then hit Wyatt into the lake. Senior Benjamin briefly searched the area for Wyatt, but wasn't able to find him. 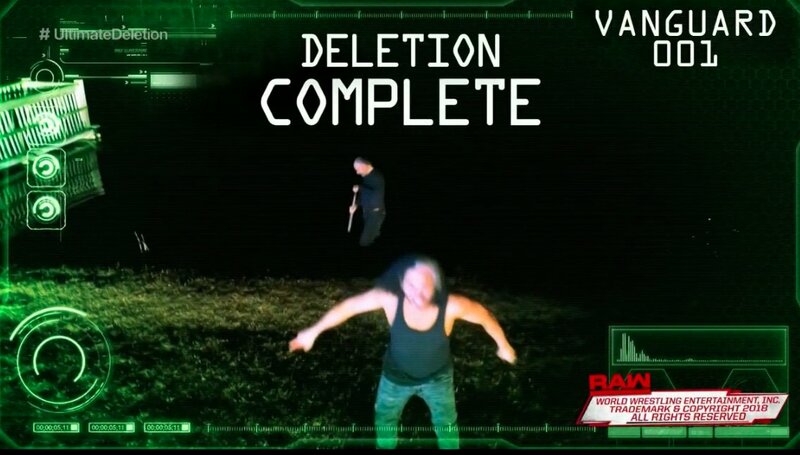 With that, Matt completed of the "Ultimate Deletion" mission. That seemingly closes the chapter on the epic Hardy-Wyatt rivalry. WWE teased that Jeff is back and ready to return to action, so there's a high probability that The Hardy Boyz tag team reunites in time for WrestleMania 34. It'll be interesting to see how this impacts Wyatt, who enjoyed one of his best singles competitor runs against Hardy. The rivalry has been ongoing for a few months, and this was the perfect way to end it. Hard to envision WWE continuing it, and if they do, it won't last much longer. The 'Woken' Matt Hardy gimmick has been one of the best since he introduced it in WWE on the Nov. 27 episode of Monday Night Raw. He screamed "delete," and waited nearly four months until finally capping off the Ultimate Deletion of Bray Wyatt. The match certainly lived up to the hype in many ways, and having Jeff's unexpected return only added icing to the cake. One of the top WWE storylines/rivalries of 2017-18 supposedly comes to an end. Now, it's anybody's guess as to whom Matt Hardy shall delete next. As for Wyatt, we will wait and see who his next opponent is, and if falling into the lake changed up his character in any way.